Two cruel prophecies. A warrior with an impossible choice. Will she doom her people or save her love? When a sorcerer imprisons the knight, Bradamante discovers two prophecies about their future with devastating consequences. She can indeed wed Ruggiero, but doing so would seal his death. If she forsakes her love, then she’ll cause the downfall of the Christian empire. With the fate of her people at stake, will Bradamante choose to doom the innocent masses or the life of her one true love? Quest of the Warrior Maiden is the award-winning first novel in the Bradamante & Ruggiero historical fantasy series. If you like Arthurian myth, strong heroines, and tales of forbidden passion, then you’ll love this thrilling epic of impossible devotion. Buy Quest of the Warrior Maiden to battle for love and honor today. 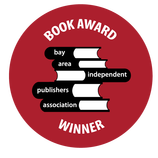 Quest of the Warrior Maiden was awarded the Best Historical Fantasy in the 2013 Bay Area Independent Publishers Association Book Contest and an Honorable Mention in Genre-Based fiction from the 2014 Hollywood Book Festival. “All great legends, whether of Britain's King Arthur, Greece's Trojan War or Europe's Charlemagne cycle contain stories of minor characters begging to be elaborated on. 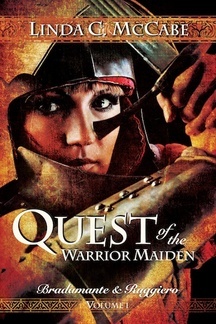 In Quest of the Warrior Maiden Linda McCabe has picked up the lesser known tale of Ruggiero and Bradamante, this last being the warrior maid of the title. Classic in its theme of young, idealistic lovers from opposing camps, it sheds a bright light on the culture, history and legends of a time and place too little explored by most western readers.” – Persia Woolley, author of the acclaimed Guinevere series. “McCabe paints a vivid portrait of Medieval France whose vestiges can still be found in the streets of modern Paris.” – Cara Black, author of the New York Times Bestselling Aimée Leduc mystery series and Murder at the Champ de Mars. “A grand and engaging re-telling of the original ‘star crossed lovers’ epic with everything Orlando – chivalry, romance, fights to the death, hippogriffs, madness, and beauty! As engaging a story as I have read this year, I couldn’t put it down and I urge you to pick it up today.” – John Granger, author of Unlocking Harry Potter. “I read the story in one sitting and was devastated to find out what I had in my hands was only volume one! I look forward to volume two.” – Ibrahim Al-Marashi, professor of History at IE University in Spain.